Lise Meitner was an Austrian-Swedish physicist who worked on radioactivity and nuclear physics. Meitner, Otto Hahn and Otto Robert Frisch led the small group of scientists who first discovered nuclear fission of uranium when it absorbed an extra neutron; the results were published in early 1939. Meitner, Hahn and Frisch understood that the fission process, which splits the atomic nucleus of uranium into two smaller nuclei, must be accompanied by an enormous release of energy. Nuclear fission is the process exploited by nuclear reactors to generate heat and, subsequently, electricity. This process is also one of the basics of nuclear weapons that were developed in the U.S. during World War II and used against Japan in 1945. Otto Stern was a German-American physicist and Nobel laureate in physics. He was the second most nominated person for a Nobel Prize with 82 nominations in the years 1925–1945, ultimately winning in 1943. Kungälv is a city and the seat of Kungälv Municipality in Västra Götaland County, Sweden. It had 22,768 inhabitants in 2010. Otto Hahn was a German chemist and pioneer in the fields of radioactivity and radiochemistry. 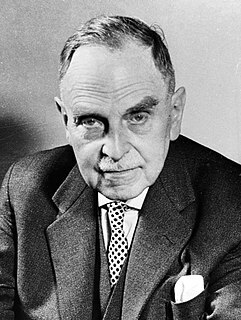 Otto Hahn discovered nuclear fission in 1938. He is referred to as the father of nuclear chemistry. He was awarded the Nobel Prize in Chemistry in 1944 for the discovery and the radiochemical proof of nuclear fission. This process is exploited by nuclear reactors and is one of the basics of nuclear weapons that were developed in the U.S. during World War II. Friedrich Wilhelm "Fritz" Strassmann was a German chemist who, with Otto Hahn in early 1939, identified barium in the residue after bombarding uranium with neutrons, results which, when confirmed, demonstrated the previously unknown phenomenon of nuclear fission. In mid-1939 Frisch left Denmark for what he anticipated would be a short trip to Birmingham, but the outbreak of World War II precluded his return. With war on his mind, he and the physicist Rudolf Peierls produced the Frisch–Peierls memorandum at the University of Birmingham, which was the first document to set out a process by which an atomic explosion could be generated. Their process would use separated uranium-235, which would require a fairly small critical mass and could be made to achieve criticality using conventional explosives to create an immensely powerful detonation. The memorandum went on to predict the effects of such an explosion—from the initial blast to the resulting fallout. This memorandum was the basis of British work on building an atomic device (the Tube Alloys project) and also that of the Manhattan Project on which Frisch worked as part of the British delegation. Frisch and Rudolf Peierls worked together in the Physics Department at the University of Birmingham 1939–40. He went to America in 1943 having been hurriedly made a British citizen. In 1944 at Los Alamos, one of Frisch's tasks as the leader of the Critical Assemblies group was to accurately determine the exact amount of enriched uranium which would be required to create the critical mass, the mass of uranium which would sustain a nuclear chain reaction. He did this by stacking several dozen 3 cm bars of enriched uranium hydride at a time and measuring rising neutron activity as the critical mass was approached. The hydrogen in the metal bars increased the time that the reaction required to accelerate. One day Frisch almost caused a runaway reaction by leaning over the stack, which he termed the "Lady Godiva assembly". His body reflected neutrons back into the stack. Out of the corner of his eye he saw that the red lamps that flickered intermittently when neutrons were being emitted, were 'glowing continuously'. Realizing what was happening, Frisch quickly scattered the bars with his hand. Later he calculated that the radiation dose was "quite harmless" but that if he "had hesitated for another two seconds before removing the material ... the dose would have been fatal". "In two seconds he received, by the generous standards of the time, a full day's permissible dose of neutron radiation." In this way his experiments determined the exact masses of uranium required to fire the Little Boy bomb over Hiroshima. Before he retired he designed  a device, SWEEPNIK, that used a laser and computer to measure tracks in bubble chambers. Seeing that this had wider applications, he helped found a company, Laser-Scan Limited, now known as 1Spatial, to exploit the idea. He retired from the chair in 1972 as required by University regulations. He died on 22 September 1979 and was cremated on 5 October at Cambridge City Crematorium. His son, Tony Frisch, is also a physicist. 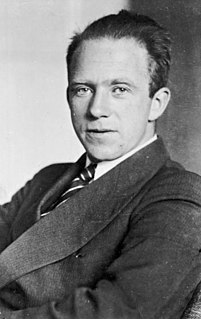 Werner Karl Heisenberg was a German theoretical physicist and one of the key pioneers of quantum mechanics. He published his work in 1925 in a breakthrough paper. In the subsequent series of papers with Max Born and Pascual Jordan, during the same year, this matrix formulation of quantum mechanics was substantially elaborated. He is known for the Heisenberg uncertainty principle, which he published in 1927. Heisenberg was awarded the 1932 Nobel Prize in Physics "for the creation of quantum mechanics". John Ray Dunning was an American physicist who played key roles in the Manhattan Project that developed the first atomic bombs. He specialized in neutron physics, and did pioneering work in gaseous diffusion for isotope separation. He was Dean of the School of Engineering and Applied Science at Columbia University from 1950 to 1969. The Frisch–Peierls memorandum was the first technical exposition of a practical nuclear weapon. It was written by expatriate German physicists Otto Frisch and Rudolf Peierls in March 1940 while they were both working for Mark Oliphant at the University of Birmingham in Britain during World War II. Francis Goddard Slack was an American physicist. He was a physics teacher, researcher, and administrator in academia who was renowned for placing equal emphasis on teaching and on research. G. Norris Glasoe was an American nuclear physicist. He was a member of the Columbia University team which was the first in the United States to verify the European discovery of the nuclear fission of uranium via neutron bombardment. During World War II, he worked at the MIT Radiation Laboratory. He was a physicist and administrator at the Brookhaven National Laboratory. Eugene Theodore Booth, Jr. was an American nuclear physicist. He was a member of the historic Columbia University team which made the first demonstration of nuclear fission in the United States. During the Manhattan Project, he worked on gaseous diffusion for isotope separation. He was the director of the design, construction, and operation project for the 385-Mev synchrocyclotron at the Nevis Laboratories, the scientific director of the SCALANT Research Center, and dean of graduate studies at Stevens Institute of Technology.Booth was the scientific director of the SCALANT Research Center, in Italy. Siegfried Flügge was a German theoretical physicist and made contributions to nuclear physics and the theoretical basis for nuclear weapons. He worked in the German Uranverein. From 1941 onward he was a lecturer at several German universities, and from 1956 to 1984, editor of the 54-volume, prestigious Handbuch der Physik. Gerhard Hoffmann was a German nuclear physicist. During World War II, he contributed to the German nuclear energy project, also known as the Uranium Club. Gottfried Freiherr von Droste (1908–1992), a.k.a. Gottfried Freiherr von Droste zu Vischering-Padberg, was a German physical chemist. He worked at the Kaiser Wilhelm Institute for Chemistry (KWIC). He independently predicted that nuclear fission would release a large amount of energy. 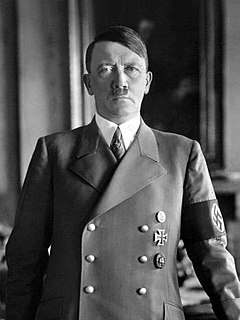 During World War II, he participated in the German nuclear energy project, also known as the Uranverein. In the latter years of the war, he worked at the Reich’s University of Strassburg. After the war, he worked at the Physikalisch-Technische Bundesanstalt (Federal Physical and Technical Institute and also held a position at the Technical University of Braunschweig. Terrestrial Physics is a sculpture by American artist Jim Sanborn which includes a full-scale working particle accelerator. It was displayed in the Museum of Contemporary Art as part of Denver's Biennial of the Americas from June–September 2010. 1 2 3 Peierls, R. (1981). "Otto Robert Frisch. 1 October 1904 – 22 September 1979". Biographical Memoirs of Fellows of the Royal Society . 27: 283–306. doi:10.1098/rsbm.1981.0012. JSTOR 769874. ↑ Bethe, H. A.; Winter, George (January 1980). "Obituary: Otto Robert Frisch". Physics Today. 33 (1): 99–100. Bibcode:1980PhT....33a..99B. doi:10.1063/1.2913924. Archived from the original on 2013-09-28. ↑ Meitner, Lise; Frisch, O. R. (1939). "Disintegration of Uranium by Neutrons: a New Type of Nuclear Reaction". Nature . 143 (3615): 239–240. Bibcode:1939Natur.143..239M. doi:10.1038/143239a0. The paper is dated 16 January 1939. Meitner is identified as being at the Physical Institute, Academy of Sciences, Stockholm. Frisch is identified as being at the Institute of Theoretical Physics, University of Copenhagen. ↑ Frisch, O. R. (1939). "Physical Evidence for the Division of Heavy Nuclei under Neutron Bombardment". Nature. 143 (3616): 276. Bibcode:1939Natur.143..276F. doi:10.1038/143276a0. Archived from the original on 3 August 2004. The paper is dated 17 January 1939. [The experiment for this letter to the editor was conducted on 13 January 1939; see Rhodes, Richard (1986). The Making of the Atomic Bomb. Simon and Schuster. pp. 263 and 268. ↑ "Fame without a Nobel Prize". 1 2 3 Frisch, Otto Robert (1980). What Little I Remember. Cambridge University Press. pp. 161–162. ISBN 0-52-128010-9. We were building an unusual assembly, with no reflecting material around it; just the reacting compound of uranium-235 ... For obvious reasons we called it the Lady Godiva assembly. ↑ Rhodes, Richard (1986). The Making of the Atomic Bomb. Simon and Schuster. pp. 610–11. ISBN 9780671441333. ↑ "Experiments with the Dragon Machine". Wikimedia Commons has media related to Otto Frisch .